The likes of Winx and Unforgotten might be the stars of the Chris Waller camp but he has a couple of handy understudies in the shape of Oaks winners Egg Tart and Youngstar. Both mares, the past two Queensland Oaks winners, signalled they are in for big spring campaigns with their first-up efforts in the Group 2 Tramway Stakes (1400m) at Randwick, running fifth and sixth respectively behind stablemate Comin’ Through. 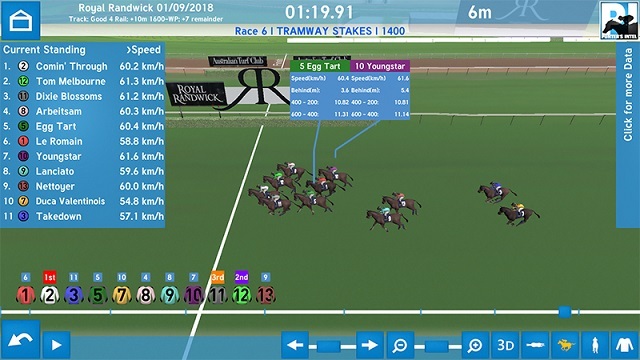 Punters Intel data reveals Youngstar recorded the fastest last 600m of 32.97 out of the race, the only horse to break 33 seconds, and her last 200m of 11.02 was also superior. Her year older counterpart Egg Tart was one of the hard luck stories of the Tramway, she was held up at a couple of vital stages, but still ran the second best last 200m of 11.07 and a respectable 33.20 final 600m. It might pay to forgive Lanciato who, on face value, looked disappointing. While he finished eighth he still ran 33.27 for his last 600m and his 400m-200m split of 10.75 was the best of the race so there was some merit in the run. Waller also has plenty of firepower in the male staying stocks and his import Brimham Rocks looks a coming winner after a slashing third in the 2000m benchmark race. He was second-up, and a month between runs, and conceded as much as 44m in the middle stages before charging home in 33.69 for his last 600m, easily the best of the race. Between the 400m-200m he clocked 11.10, which was the fastest of any sectional in the event, and sustained the run with an 11.13 final 200m. Proven stayer Libran again showed he will be a force in races like The Metropolitan with another eye-catching effort running third in the Group 2 Chelmsford Stakes (1600m). He ran 33.42 for his final 600, comfortably the best of the race, and his 10.86 (400-200) and 11.25 (final 200m) were also the quickest which is hard to believe when you look at how the winner Unforgotten hit the line (11.33). Our first look at The Everest champ Redzel for this season showed the six-year-old has returned in top order though he didn’t run the fastest sectionals in the Group 3 Concorde Stakes (1000m). That honour went to Boss Lane who ran 32.16 for his last 600m in finishing fourth and the best last 200m of 11.05. It’s a shame he has to bump into the likes of Redzel and co! Redzel ran his last 600m in 32.47 (11.17 last 200m), runner-up Kaepernick clocked 32.33 (11.19) while the well supported Invincible Star weakened late running 32.72 and 11.39. The champ Winx served further warning that she’s at the top of her game with a sizzling dash home in the 1000m jump out that preceded the Randwick meeting. Winx just kept warming up through the gallop running 11.58 (600-400), 11.07 (400-200) and a final 200m of 10.52. It’ll also pay to stick with the Matt Dale-trained Rapture Miss, who conceded 30m at the 800m before flashing home in 34.71 in the Highway; and Outback Barbie spotted her Furious rivals 21m at the 600m but produced a race best 32.74 final 600m.